Home / truth / THESE 7 Companies Support Child Slavery! Avoid them! If you don’t like chocolate, chances are you’re one of few. Americans eat nearly 18% of the world’s chocolate confectionery value — that’s around $18.27 billion worth! Whether we’re eating it in the form of cakes, candy bars, milkshakes, ice cream, fondue or small, individually wrapped pieces, chocolate is a common and often addicting treat for many. Besides the possible sugar overload and questionable ingredients that many companies use, there is another downside to chocolate, as good as it may taste. Many Americans purchase chocolate without thinking about where it actually came from or who made it. 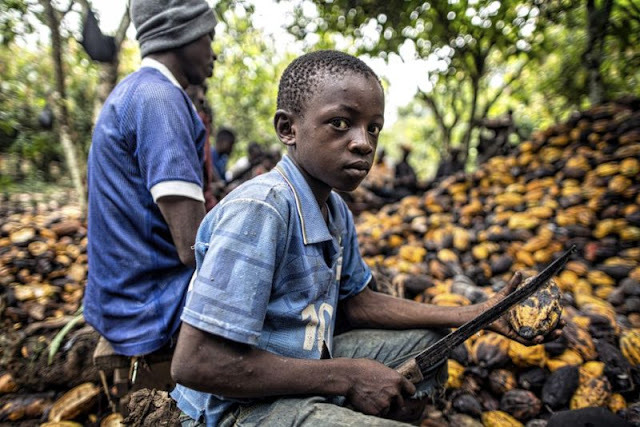 While this might not sound like a big deal, it is, because a variety of large corporations have been accused of using child slavery to produce the chocolate you might be purchasing. 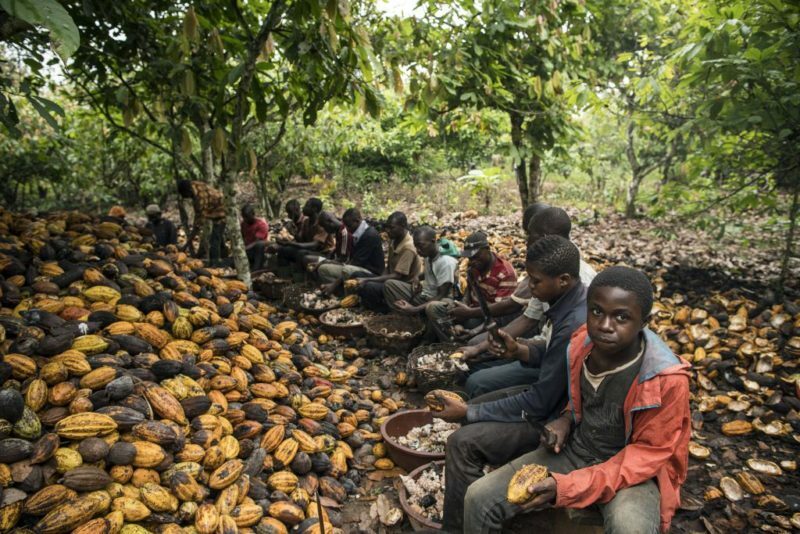 Children join farmers in breaking cocoa pods on an Ivory Coast farm in December. Nearly four in 10 kids on such farms suffered wounds or cuts during the 2013–14 growing season. A lawsuit was filed in September 2015 against a list of companies, including ones you know all too well — Hershey, Mars and Nestle. 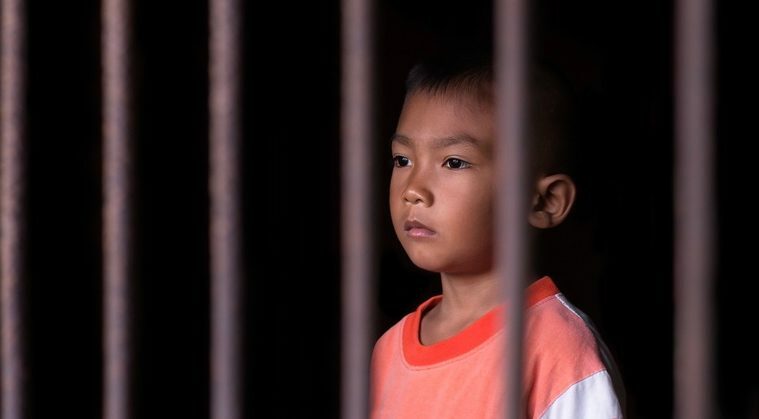 The lawsuit claimed that companies were tricking their consumers into funding the child labor slave trade in West Africa, by purchasing their products without knowledge of the facts. While this lawsuit was recently filed, child slave labor has been a concern in the chocolate industry for the past 15 years. The main ingredient in chocolate — cocoa — is mainly grown in West Africa. The two biggest producers of cocoa are the Ivory Coast and Ghana, which produce about 60% of the world’s cocoa supply. Many companies in the chocolate industry rely on West Africa for their cocoa. Most of it is produced on small farms by those who are suffering from severe poverty, which can result in child labor. In 2001, the chocolate industry pledged to end these practices in the Ivory Coast and Ghana by the year 2005, but efforts to do so have been repeatedly pushed back. The year 2020 is the new deadline — 15 years off from what they originally promised. Despite the constant news and consumer pressure on the subject, the number of children working in the cocoa industry has increased by 51% from 2009 to 2014, because these large companies are still making a profit. If you want some excellent chocolate that doesn’t support childhood slavery, try Sacred Chocolate!